26th March 2019 7.30 p.m. The run will finish at Garvan Homestead on S.H. 1 where you will be hosted by Bob and Bronwyn Alexander and the Lovells Flat Women’s Institute ladies will cater an afternoon tea at $5.00 per person. Also there will be a talk/display of items from Rochelle Fox of Disability Services with aids to help with everyday tasks etc. These will be available for purchase. The ladies look forward to your support for their fundraising venture. March 2019 Welcome to new members Mr & Mrs Trevor Martin of Owaka. We trust you will make yourselves known to members and enjoy all the Club has to offer. A very interesting visit was made to the Auto Restoration business of Jason Brookland on High Street following the meeting. Jason has worked in the industry since leaving school earning many qualifications over the years. Vehicles he is presently working on include Falcons, E Type Jag, Holden Kingswood, Dodge, an Austin Truck and the Chevrolet Coupe belonging to member Peiter Post. The work he is doing requires a lot of skill and I observed he makes an excellent job. The Weekender was discussed at length and decided to leave it for this year as time/date was not suitable for many, also there will be cruise ships in Dunedin during the month of April when it was mooted to be. Gordon Duthie is working on a day outing for the coming months and John Cook has an idea for a Weekender for the year 2020. 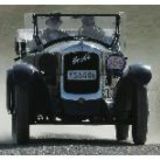 Robin McCall spoke of the upcoming Wheels into Wanaka at Easter where Alan Dippie has a big display organised. Gore Branch Visit – 26th March Town & Country Club Balclutha 12.30 p.m. for lunch of Fish & Chips $15.00 each Book with Jude McNab by the 22nd March. 03 4181522 Members to bring their Vintage vehicles along as their will be a photo taken. Following lunch the Gore Club members will travel to Glenfalloch, Lochindorb and home through Owaka Valley. 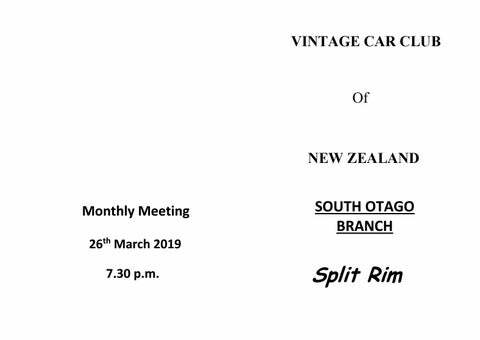 South Otago members can join in if they wish. Wednesday Run - Don Jenks organised a visit to the Tahakopa area. 24 people came along for the run starting at the Clubrooms 1 p.m. McCall’s came in their new vehicle, a 1969 Zephyr Zodiac. Leaving Baclutha travelling towards Owaka, turning onto Hunts Road, travelled passed Katea Dairy Factory, Owaka valley Road, over Morris Saddle to Tawanui, Puketiro, down thru bush and headed for School Road, Tahakopa, and MacLennan, crossing over the bridge. Next descended the Puho Hill turning into Dons paddock and to the top of the hill where there is a cell phone tower. Great view of Papatowai and surrounding area. Returned to MacLennan and Owaka on the main highway with a cuppa at the Lumberjack café. Thank you Don for an interesting afternoon and learning the history of where all the Sawmills were and who ran them. A boy asks his father, "Dad, are bugs good to eat?" "That's disgusting. Don't talk about things like that over dinner," the dad replies. After dinner the father asks, "Now, son, what did you want to ask me?" "Oh, nothing," the boy says. "There was a bug in your soup, but now it’s gone." Lawrence Car Show Saturday 23rd March 2019 Gordon and Beryl Duthie have been busy organising the Car Show being held at Simpson Park. Vehicles to arrive from 10 a.m. Prize giving will be 1.30 – 2 p.m. There will also be the opportunity to take part in a drive with prizes for this too. Proceeds from the day will go towards a Skate Park for the town. They look forward to your support. Lawrence Car Show from 10 a.m. – Simpson Park Blue Smoke & Pedals Central Otago Mopeds Gore Club Visit to T & C for lunch 12.30 p.m.